Spinach: The nutritional profiles of spinach makes it first choice of food for asthmatics. Studies show that beta-carotenes, vitamin C, vitamin E, and magnesium found in spinach reduces the chances of asthmatic attack by 40% in asthmatic patients. Cabbage: Very recent studies indicate that routine use of cabbage, especially raw cabbage in form of juice or salad reduces the risk of allergic attack. Routine use also improves the tolerance to allergen and thus reduces the severity of asthmatic attack. Amla: As an abundant source of vitamin C, Amla are very helpful in improving immunity and tolerance in the patient. The anti-inflammatory action of amla helps in reducing severity of asthma. Kuttu or Buckwheat: Kuttu which is usually eaten during fasts in India is a very good food for asthmatic patients as it is very hypoallergic. Additionally, Kuttu contains magnesium which relaxes the muscles of airway and thus helps in reducing airway constriction. Sunflower seeds and flax seeds: Having these seeds as mouth freshener should be a routine habit of asthmatic patient. These nutty seeds are loaded with selenium which reduces bronchoconstriction and relieves breathlessness in the patient. Apples: Apples have bioflavonoid called quercetin which is a potent anti-inflammatory and anti-histaminic chemical. Daily intake of fresh apple juice reduces the chances of wheezing due to asthma by 50% in children. Turmeric: A well-known anti-inflammatory and anti-septic agent. Turmeric intake boosts the patient’s immunity and reduces the congestion and wheezing. Ginger & Garlic: Ginger & Garlic has got potent anti-inflammatory activity and thus eating them raw daily reduces the production of enzymes and other chemical substances in the body which causes asthmatic attack. Tomatoes: Tomatoes are a very good source of lycopene which is an anti-inflammatory substance. Make sure you take cooked tomatoes in form of soup, sauce or curry as absorbable lycopene is only present in cooked tomatoes and not the raw ones. Rhizomes: Rhizomes like carrots and sweet potatoes are very good for asthmatics as they are rich source of vitamin C, beta-carotene, and potassium. No foods are specifically identified as restricted foods for asthmatic patients. 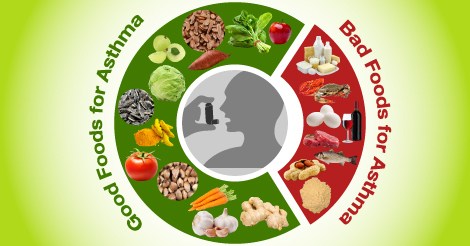 An asthmatic patient needs to keenly observe the routine foods changes which brings about any asthmatic attack and in the process identify the allergic food. However, an asthmatic attack can also be triggered by other allergens like dust, pollen, pet hairs, etc. ; and therefore identifying an allergic food becomes very difficult. Globally known allergic foods like eggs, peanuts, milk and milk products, red meat, seafood, chickpea flour (besan), nuts, and red wine must be used by the patient with extreme precaution.